If you are doing business research, we have several business-specific databases you can use. One such resource is Plunkett Research. Plunkett provides industry trends, statistics, and analysis on companies and industries. Plunkett’s database offers information on over 25,000 public companies and 4,000 private companies. Using Plunkett’s can help you determine industry trends and opportunities. Used in conjunctions with business article databases, this resource can help provide you with the “big picture” on a company, industry, or trend. Want to learn more? Check out this video for an overview, see Plunkett’s FAQ or tutorials, or come see a librarian! Need to compare a company against an industry as a whole? Want to access the latest news on a company? 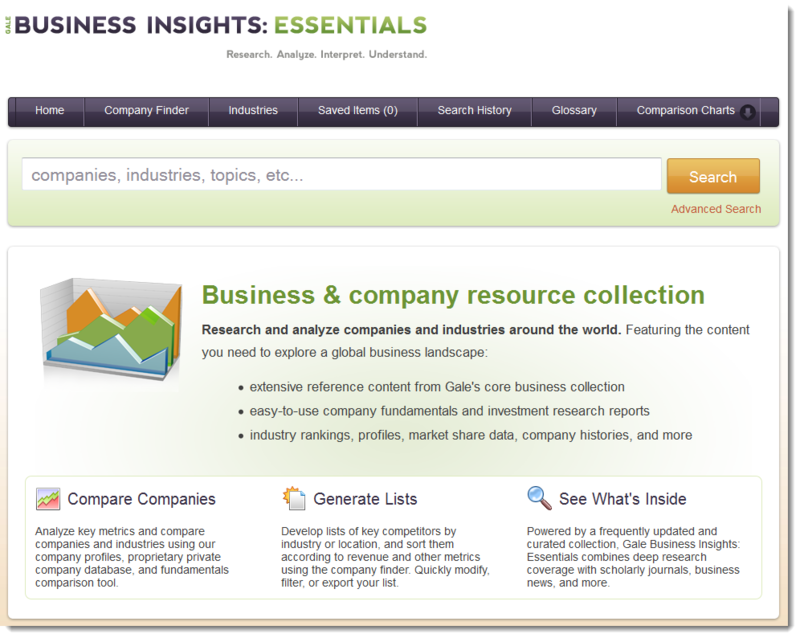 Look no further than Gale’s Business Insights: Essentials. This resource provides company profiles, industry rankings, news and analysis, products and brands, investment and financial information. SWOT analyses are available on hundreds of global companies. If you need help getting started, contact one of the Reference Librarians for a quick tutorial. The library has a new subscription database: Plunkett Research Online. The Plunkett database contains hundreds of industry reports, from advertising to wireless industries. You can also market research & build industry reports. This valuable resources is available to ECC students & staff, both on-campus and off-campus. It will be useful to business, marketing, and entrepreneurship classes.